Chad is a cycling coach with Endurancewerx and experienced Cat 1 racer. John got his first road bike in September 2015 after riding the NYC Century on a creaky 1987 Schwinn, and hasn't looked back since. 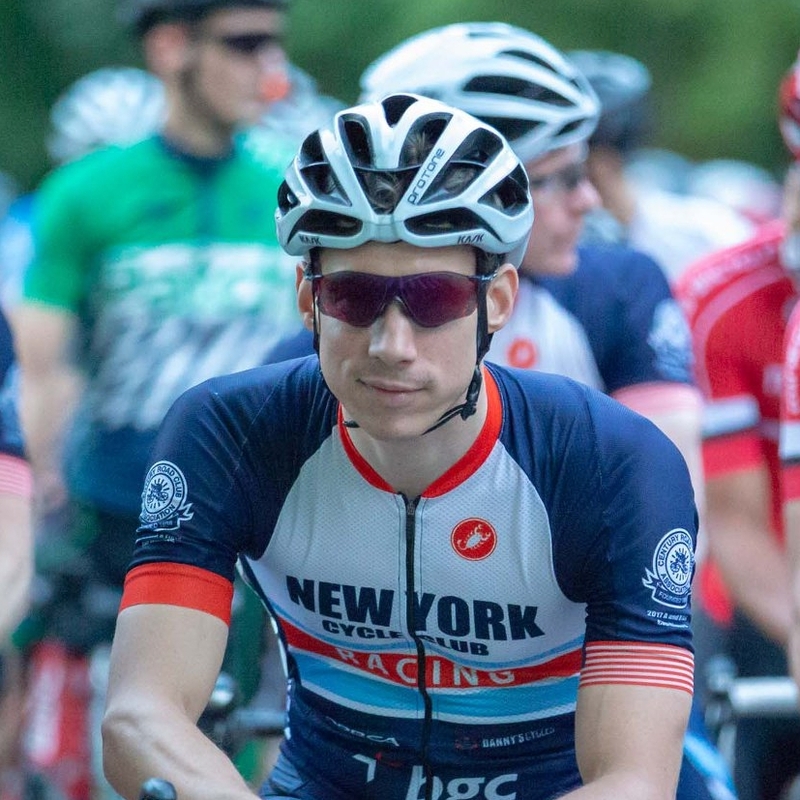 Doing the NYCC A-Classic SIG helped him learn to ride like a grown-up, and he first dipped his toe into racing in late summer 2016, joining what would become the NYCC team shortly thereafter. In the 2017 season, he was thrilled to make it from Cat 5 to Cat 3! Nick started training in the summer of 2017, riding in the mountains around the Hudson Valley with his dad. In his first season, he quickly upgraded from Cat 5 to Cat 3. James is the founder of the NYCC Racing and Development Program, enthusiastically building the team from the ground up. James can be seen in the park every day at 5am, rain or shine, and his training paid off for a recent Cat 3 upgrade. Rower turned cyclist, Ricardo upgraded from Cat 5 to Cat 3 in his first season of racing! Roman exhibits pure bipedal mastery with the speed of a leopard and spring of a puma. A founding member of the team, he had several wins in 2017 season, earning a spot in Cat 3. When he is not riding his bike, Allan is thinking about riding his bike. A former triathlete, he is an active member of NYCC Racing's Triathlete Rescue Program. While not a strict velominati, he firmly believes in Rule #5. Dieter joined the NYCC racing team in 2017. He enjoys time trials and chasing after KOMs. When not racing, you can find him riding his bike to transport pumpkin pies. Daniel completed his first NYCC "Attack to Nyack" ride in January 2016, where he met some great guys who liked to ride fast. Then, NYCC Racing was born and he joined. The rest is history. Natan did not own a bike past age 8. In the past three years he has been trying to make up missed mileage. Natan started racing in 2017 and plans to score some points for the Cat 4 squad in 2018. Michel, a student at Queens College studying computer science and mathematics, is a new member of the Cat 4 squad for 2018! Cyrus was at a dinner party with friends where everyone was complaining about their bodies getting fat, weak, and breaking down. He decided that very night that enough was enough. There would be no more wine and cheese, no more cake and ice cream. It only remained, in the dawn hours of that dark night of the soul, to find a pursuit worthy of his degree of commitment, deprivation, and self-hatred. So he bought a bike. He immediately began racing in that spring of 2014 and never looked back. He's a founding member of NYCC Racing and loves his team! Johel is a graduate of NYCC's A-SIG, and A-Classic Spring Training Programs. Johel started racing in 2017 when he joined the NYCC Racing team, and is looking forward to contributing to the success of the team in the C, and B fields in 2018. Thomas is an avid cyclist and has been a regular on the NYCC R/D Attack! rides, but started racing in the 2018 season. He was introduced to the team through Alex Sun, a co-founder of the team, and looks forward to contributing to the team's success. Charlie is the youngest member of the NYCC club and race team! He took 2nd place at the Dave Jordan Classic Juniors race in 2017!